Inspired By Chandelier Glass Of The Victorian Period, This Collection Features White Hand-Blown Glass With Beautiful Flutes And A Leaf Motif. A Simple Oiled Bronze Finished Frame Compliments The White Glass Adding Idyllic Charm. 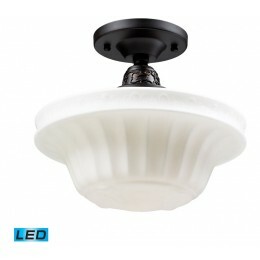 - LED Offering Up To 800 Lumens (60 Watt Equivalent) With Full Range Dimming. Includes An Easily Replaceable LED Bulb (120V). The ELK 66221-1-LED Quinton Parlor collection Close to Ceiling Lighting in Oiled Bronze uses LED light output and brings Antique style. The total wattage is 13.5 and the voltage is 120 volts. The ELK Lighting 66221-1-LED requires 1 bulb (included). Additional Information: Shade-White Glass - Type 22.